Do you recommend something you guys have used before?.. obviously good price (for someone in US). Sometimes you can find cheap VGA extension cables. They have 15 conductors. I think Gavin1968 was printing them for the Sdrive-Max's he was selling. Maybe he'll sell you some. This is great, thanks for the information... I will also check if I have a decent VGA cable to cannibalize, excellent idea! I got some SIO plugs from Bill Lange (as well as a few SDrive-Max cases). Have you tried contacting https://printathing.com/for 3D printing items (such as the molex connectors/Atari SIO connectors) that are on thingiverse? 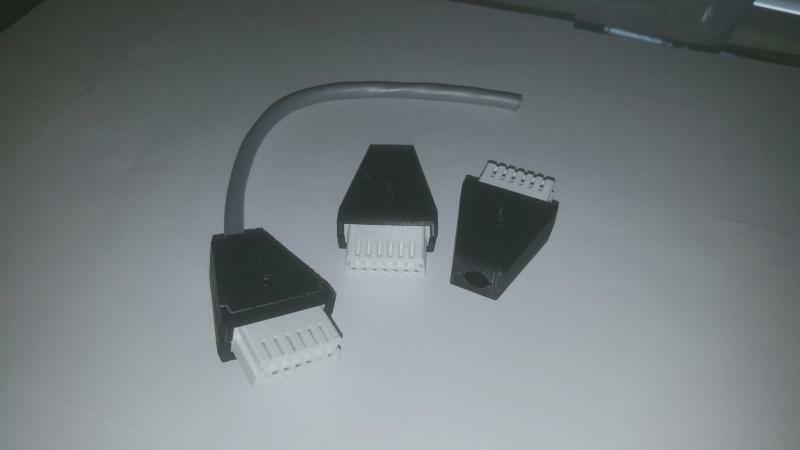 After that you just need the crimping tool and the Molex KK 396 connectors? I know Lotharek sells them but shipping from Poland is brutally expensive and the cheapest option is crazy-slow. Or you have them send to somebody in Europe and you join us at this years Fujiama and pick your stuff up. (Unfortunately, Lotharek never comes to the Fujiama himself) This years Fujiama will last a whole week! OK, so it's not the fastest way to get some stuff from Europe to you, but it is the one where you have the most fun! Edited by Mathy, Sun Feb 17, 2019 5:31 PM. Probably a home-made SIO2PC device. It's a PCB with 6 connectors on one side, seven on the other that you can slowly build up with tin and then insert (carefully) into an SIO port. It is a connector which it is just a PCB.